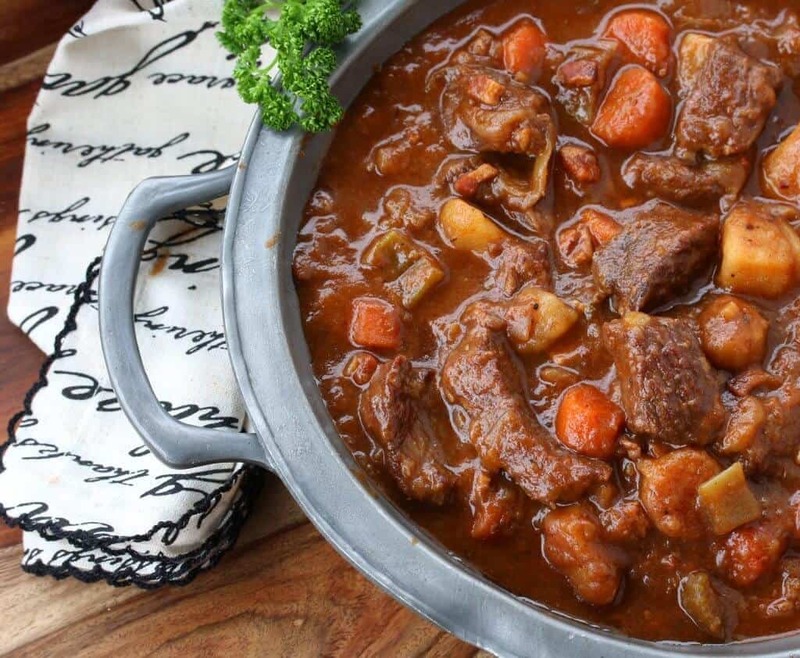 Among Ireland’s most iconic pub foods, this rich and robust Irish Beef and Guinness Stew will make your taste buds sing and have you begging for seconds! Nothing speaks comfort like a good beef stew. 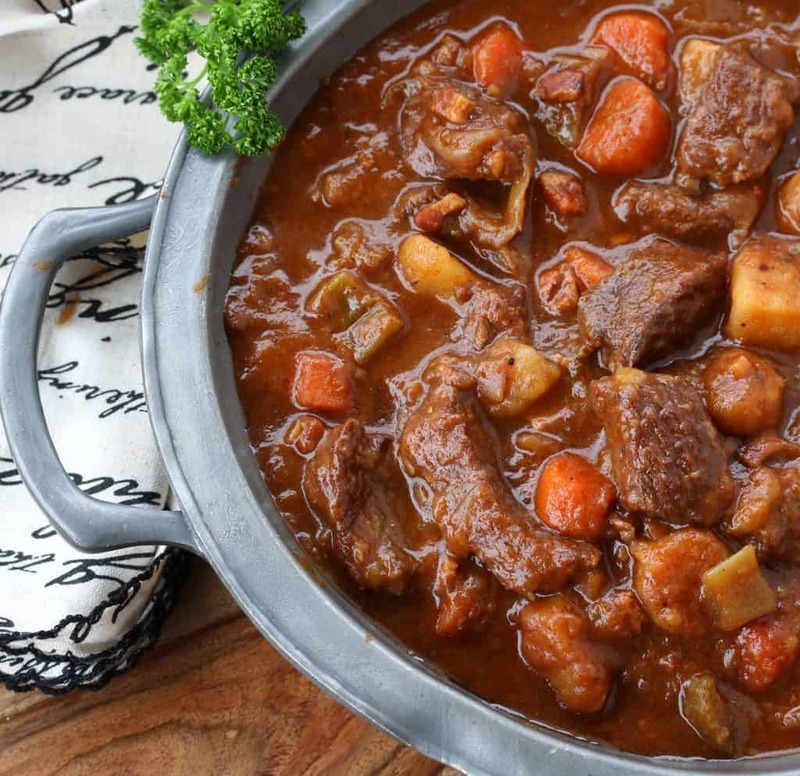 Variations of beef stew are found around the world and a few famous examples include France’s Boeuf Bourgignon, Hungary’s Goulash, and Belgium’s Carbonnade à la Flamande (recipe to come). The first one is simmered in wine, the second generously seasoned with paprika, and the third simmered in beer. 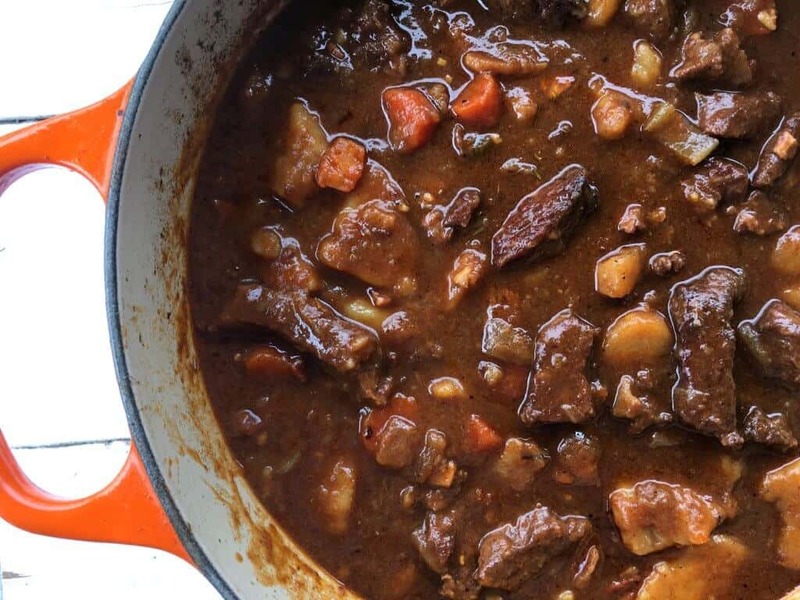 Today we meet Ireland’s iconic version: Beef and Guinness Stew. 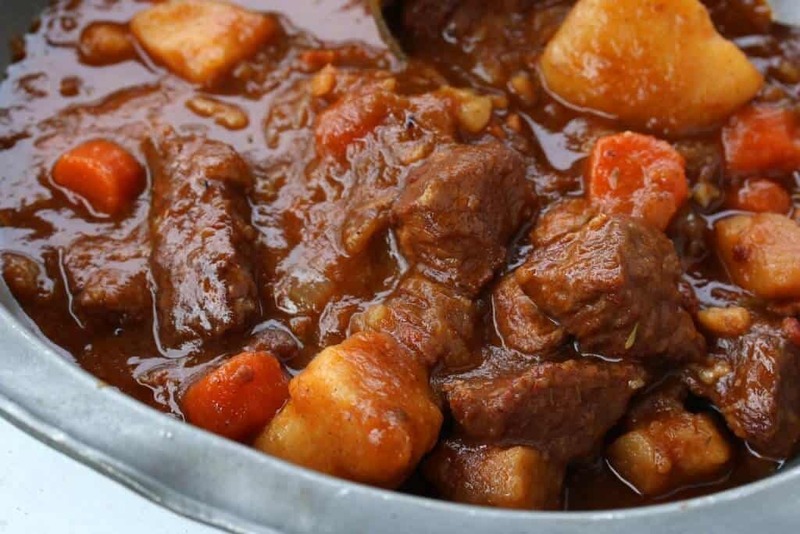 As its name suggests, what sets Ireland’s beef stew apart from others is its inclusion of Guinness stout. 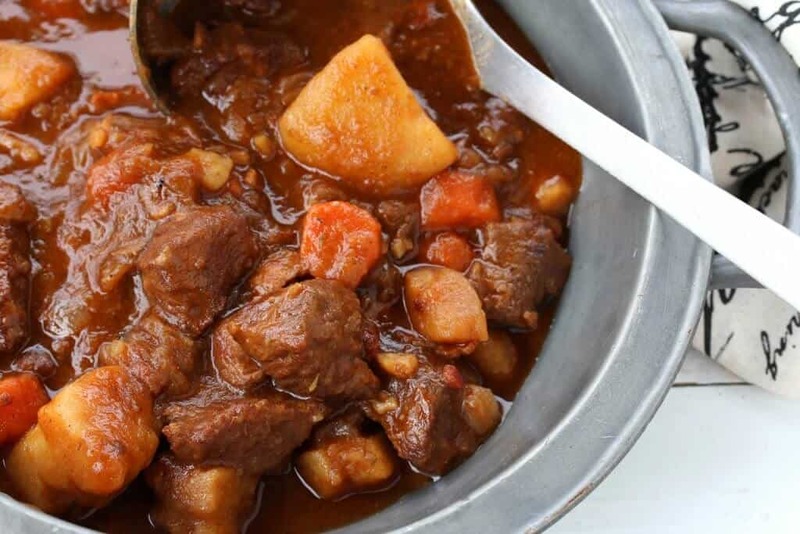 The alcohol is evaporated as the simmers low and slow and you’re left with a deep and robust flavor with fork-tender beef, waxy potatoes and the sweetness of parsnips and carrots. Guinness Beef Stew is traditional Irish pub fare. You’d probably be hard-pressed to visit a pub in Dublin and not find it on the menu. When it comes to dining out in the British Isles, Pub food is among the best for homestyle meals with bold flavors and good prices. 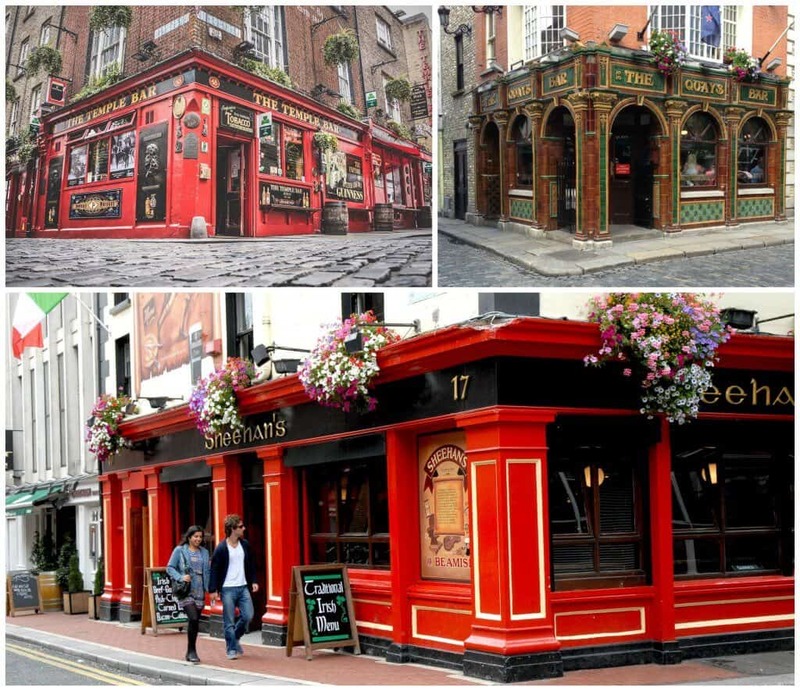 Dublin has many to choose from – everything from The Brazen Head (Dublin’s oldest pub) to Mulligan’s (where celebrities like John F. Kennedy and Doris Day dined), Arthur’s Pub, Sheehan’s, Temple Bar Pub, and The Quay’s Bar. Several of these are located in the heart of Dublin’s cultural quarter quarter, the Temple Bar district, and are especially renowned for their Guinness beef stew, a favorite among tourists and locals alike. Beef & Guinness Stew is easy but there are a couple of steps that are absolutely imperative for the flavor. First and foremost: Brown the beef! Don’t be impatient and skip this step. It’s crucial. So take the time to brown the beef in batches, every last piece. Once you’ve done the browning followed by briefly sauteing the vegetables, you can transfer everything to a slow cooker if you prefer. The other thing is this: Don’t throw out the browned beef bits in the bottom of the pan! That’s where a ton of the flavor is, caked onto the bottom of the pan. Leave it and deglaze (scrap off the browned bits) when you add the Guinness. If you follow those two steps and the rest of the recipe as follows, you’re going to have one amazing Irish Beef and Guinness Stew! There’s no need to buy an expensive cut of beef for a beef stew that’s going to simmer for a long time. Get an inexpensive, well-marbled cut. You can ever go wrong with a chuck roast (what I’m using here). Cut the beef across the grain into into 1-inch pieces. Sprinkle with some salt, pepper and the flour and toss to coat the pieces. Set aside. Working in batches and being careful not to overcrowd the pieces, generously brown the beef on all sides. Transfer the beef to a plate and repeat until all the beef is browned. Don’t wash out the pot when you’re done, leave the blackened bits on the bottom of the pot (that’s where a ton of flavor be!). Add the onions and fry them, adding more oil if necessary, until lightly browned, about 10 minutes. Add the vegetables and cook for another 5 minutes. Add the Guinness and bring it to a rapid boil, deglazing the bottom of the pot (scraping up the browned bits on the bottom). Boil for 2 minutes. Return the beef and bacon to the pot along with the remaining ingredients. Stir to combine and bring to a boil. Reduce the heat to low, cover and simmer for 2 hours. Add salt and pepper to taste. Dish up the stew and enjoy it hot with some crusty country bread or Irish soda bread. This stew tastes even better the next day. Experience the robust flavor of this world famous stew! Fry the bacon in a Dutch oven or heavy pot until done then remove it with a slotted spoon, leaving the bacon drippings in the pan. Transfer the beef to a plate and repeat until all the beef is browned. Bring it to a boil. Reduce the heat to low, cover and simmer for 2 hours. Add salt and pepper to taste. Serve with some crusty country bread or Irish soda bread. This soup is even better the next day. Your photos always make me want to cook your recipes. You list the dried porcini mushrooms twice in different measurements, in ingredients list, bet it adds an interesting flavor to this stew, are you supposed to add it twice or is this an error? Thank you, Sue! :) And thanks for catching that – I’ve updated it, you only add them once. I made this when you posted it last time and it was fantastic. I think the porcini mushrooms added a lot of depth of flavour. Thank you for sharing. That’s wonderful, Leslie, I’m thrilled to hear that – thanks so much for letting me know! I loved our time spent in Dublin…this looks fantastic. What time should I be over? THIS LOOKS SOOOOOOO DANG GOOD! So true about browning the meat and using the glaze! Makes all the difference. Nothing more comforting than some stick-to-your-ribs stew! I’m putting this on my next meal plan, thanks for the recipe! Whenever possible, I prefer to cook something that takes this long in the oven as opposed to the stovetop. Thoughts? 2 hours at 325* maybe? Hi Beth! Yes, I’d bake it at 325 F, probably closer to 3 – 3 1/2 hours, and you may want to wait to add the potatoes during the last 1 to 1 1/2 hours of baking. Looks incredible! Definitely need to make this happen during the next cold snap! This stew looks phenomenal! I love a good hearty beef stew. Can’t wait to try this recipe. Can I do this the main part of this cooking in the slow cooker? Hi Geoff, I would aim for 325 F and check it after 2 to 2 1/2 hours to see if the beef is fork tender. I will use my slow cooker. Are your directions for low heat for 6-8 hours, AND then high for 3-4 hrs? OR is it one OR the other? We had Guinness stew at the Guinness Storehouse in Dublin last month, and it was the best of the several we ate in Ireland. I don’t know if it was their recipe, or the freshness of the Guinness. Hi Dave, it’s either or, not both. Happy cooking and I hope you enjoy the stew! So do we add Guinness in the pan while sauteing the onions and vegeies…the do rest in crockpot?….or add the Guinness in the crockpot? Hi Desiree, the first one is correct – add the Guinness in the pan first and then add everything to the crockpot. Use the Guinness to deglaze – like you might typically use wine – to scrape up all the tasty brown bits of meat. I had Irish stew with Guinness made by a genuine Irish woman over 10 years ago and I still remember it, it was so delicious! I have never made it myself but seeing your picture make me want to start immediately. I’m from Germany and me and my husband LOVE Irish beer and some beef stew. I normally make it with lots and lots of onions and red bell peppers but this one is gonna be our favorite from now. This was so so good OMG I want to cook it every day it’s that good!!! Made it. Loved it! This has great flavor. Next time (since I have 3 Guiness left over from the 4 pack I bought) I am going to try this with lamb. What do you think, Kimberly? By the way, every recipe I have made from this site has been a success and I am very impressed that you respond to comments. Thank you! I am so thrilled to hear that, Beth, thank you so much! :) And absolutely, lamb is a great choice. Wow you made our St. Patrick’s Day! We usually have corned beef and cabbage but after reading this recipe we wanted to try it. It was sooo good.my husband and I love cooking together so we made this. It was fantastic. Thanks so much. Fantastic, Peggy, I’m so thrilled to hear that! What a wonderful tradition of cooking together and I’m so glad you both enjoyed this – thank you! Just finished putting it on the back burner to simmer. I am taking it to a potluck tonight. I am thinking about making some soda bread to take with it, but I don’t want to give up time to work on my quilting project. I love to cook and try new recipes so I am always excited to find new websites. Thanks for sharing your recipes. I look forward to hearing the reviews from my friends tonight. Thank you, Vicki, we’d love to hear what everyone thinks! Your photos of Dublin make me crave going there. Your Irish beef stew makes me crave a traditional Irish Beef Guiness Stew. If I could give this more than 5 stars I would, it’s that delicious!! 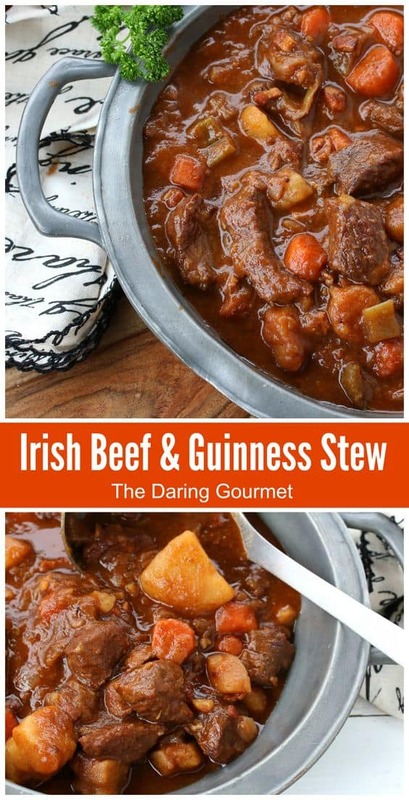 I’ve tried at least 5 different recipes for this (I had beef and Guinness stew in Ireland years ago and love it) and this one is by far the best. It reminds me of my trip to Ireland and makes me long to go back. This will be my go-to recipe from now on, thank you! Wonderful, Cori, thank you so much, I’m thrilled you enjoyed it! When it comes to dinning out in the UK??? Dublin is not in the UK, i feel offended :( and not because i dont like our UK neighbours, just that you dont bother to get it right :)… great food though, made this today! Hi Stephen, that was a miscommunication and I could have been more clear. In my mention of the UK I was merely referring to pub food in general, it wasn’t my intention to connect the two (UK and Dublin). Glad you enjoyed this stew, thank you! Is it possible to make this without the bacon? My family has a pork allergy. Hi Abi, yes, you can simply omit it. Today is my first effort. At first it appears bitter. I did some research and it might be the Guinness. Next time I’m going to use less and see how it turns out. Has anyone else had this problem? If so, how did you fix it? Hi Kim, yes, it’s the Guinness. I also thought the flavor was too bitter. Kim asked how to fix the problem. Can it be fixed and if so , how? Thanks! Hi Evelyn, that’s just the flavor of the Guinness, an acquired taste, so there’s no fix other than to omit it or to use another beer – but then it won’t be Guinness Stew. I cannot wait to try this! It looks AMAZING! I love love your submissions Kim! You never fail us. I will be making this for an upcoming gathering. I know it will not dissapoint. Thank you so much for even your online pictures for how things should look at each step. You are by FAR my favorite place to stop, when I’m stuck and needing inspiration for a new recipe. Thank you and keep up the good work! 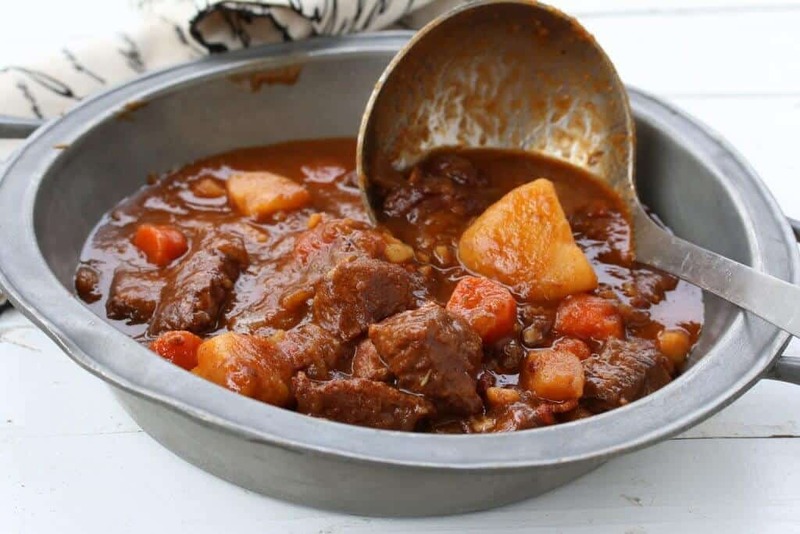 Hands down the BEST Guinness stew I’ve tried, and I’ve tried several recipes. Takes me right back to my time in Dublin. Thank you! I’m thrilled to hear that, Tim, thanks so much! This was amazing! Thanks so much for the recipe. Fantastic, Audrey, thanks so much! So add everything to crockpot but before letting it setting it to low and walking away, do this step “Add the Guinness and bring it to a rapid boil, deglazing the bottom of the pot (scraping up the browned bits on the bottom). Boil for 2 minutes. Return the beef and bacon to the pot along with the remaining ingredients. Stir to combine and bring to a boil.” Then once that part is complete, add it to slow cooker and let it simmer the day away. Great recipe and great taste. We made ours in the slow cooker on High for 4 hours. Two changes: I used pancetta instead of bacon and Guinness Draught instead of Extra Stout. (More Guinness left over for sipping) My wife told me it was the best beef stew I’d ever made and of course I took most of the credit! Fantastic, Mike, I’m glad it was a hit, thank you! I’m so glad you enjoyed it, Allen, thank you! This is a good recipe. The ingredients are perfect. However… read the ingredient list, then read the steps, then re-read the ingredient list. There are steps missing, especially if you’re doing the slow cooker method. I read and re-read and still screwed it up. Hi Shelly, I read through the ingredients and the steps in the recipe box as well as the steps in the step-by-step photographs and I’m not sure what you’re referring to. Which steps are missing? My aunt sent me just the recipe page, not your website. So, when I started making the stew, I was not looking at all of your photos too. It was just a WAY bigger project than it seemed on your one sheet. The stew was great. I wasn’t trying to be snarky or disrespectful. I just wanted to warn people that it was much more involved than your “Prep time of 20 minutes” indicates. I guess if I had 3 sous chefs helping me, it might have taken 20 minutes. You may want to change that to more like 60 minutes. I think I just missed the herbs step while using the recipe card. Everyone LOVED the stew and I will totally make it again. And pass along your site. I love it. Might try some of the GF recipes for one of my co-workers. I’m so glad you enjoyed it, Shelly, and I appreciate the honest feedback, thank you! I agree…takes at least 60 minutes of prep time…especially cutting the meat. The prep time was really worth it…great stew!!! I’m so glad you enjoyed it, Michelle, thank you! Now THIS is pure comfort food. My half Irish husband will not eat corned beef, so I’m saving this recipe for St. Patrick’s Day! One of my favorite winter comfort foods!! This stew looks so comforting! The one thing I miss most since going gluten free is Guiness…there is a gluten free beer company, Ground Breaker, who is supposed to launch a dark beer soon. I can’t wait to see how that would be in this recipe. Definitely a big bowl of comfort food! Great job! WOW!! This looks SO hearty and delicious!! I can’t wait to try it!! This looks like the perfect pot of comfort food to me! Just pinned this because it looks amazing and we might make it this weekend! Haven’t had Guiness Beef Stew in forever. It’s going to be freezing this weekend so this just very well may happen! Excellent, Wendy, please let us know what you think! 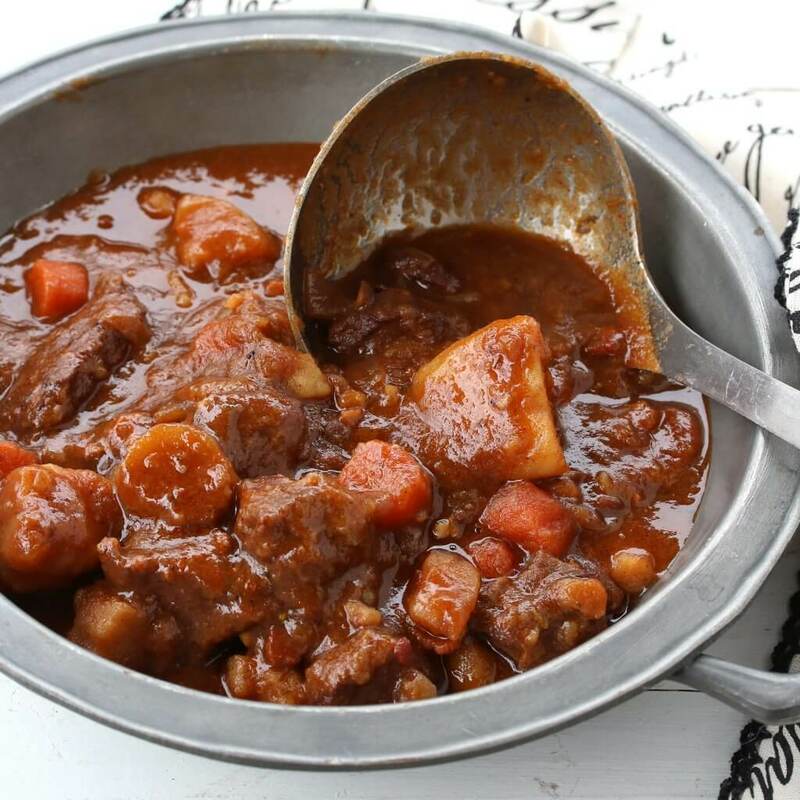 Lovely pictures of a delicious looking stew! All of the flavors sound amazing together! I’m not quite sure what I did incorrectly. I followed the instructions, used all the same ingredients, and the meat turned out very tough. The broth and vegetables are fantastic though! I will try it again. Just have to troubleshoot. Perhaps the meat wasn’t fatty enough? Or could my low stovetop temp have been too low? I’m so happy to hear that, Emma, thank you! This was absolutely delicious! Not only the best Irish beef and guinness stew I’ve had but also the best beef stew period! Truly excellent. FANTASTIC! I made this for Sunday dinner yesterday and everyone loved it! Terrific, thanks so much, Cami! Going to be making this for dinner this weekend! On Saturday we are having family over for St. Patrick’s Day, and I already got everything for corned beef and cabbage. So I am planning on making this on Sunday! I can’t wait! That’s perfect, Nisha, happy cooking, eating and please let us know what you think! I made this for St. Patrick’s Day last year and am making it again this year – it’s become a new tradition :) I just wanted to say how delicious this recipe is. It is so flavor and wonderful and we can’t wait to enjoy it again! Fantastic, Cathy, I’m thrilled to hear it, thank you! That’s great, Joy, I look forward to hearing what you think about it! Can I add frozen peas to this? If so when should I add? Thanks! Absolutely, Jackie. I’d add them in during the last 30 minutes or so. This has to be one of my all time favorite dishes ever. I know it sounds like hyperbole but it is not. I followed the instructions except for the mushrooms (couldn’t find them) and am blown away with how good this stew is. The gravy is surreal. It is so good, i’m making it again tomorrow when we (wife and I) finish the first batch. The very first meal I had in Dublin when I was there over Christmas was the Beef and Guinness Stew at Brazen Head and a pint of Bulmers Irish Cider. Seriously, one of the BEST bowls of stew I’ve ever had and I’ve been craving it since I left Dublin. Awesome, Stacy, I hope this recipe takes you down memory lane – happy cooking and eating! This was FANTASTIC!!! Made it Saturday for a dinner party and everyone raved about it! I’m so glad to hear it, Candace, thank you! This surpassed any of the Irish Stews that we had in Ireland! This is so savory in flavors. 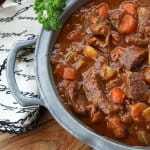 I had the Guiness Stew at the Brazenhead and it was delicious, but this recipe is WAY more flavorful! Amazing, and a keeper for sure. It went over well for our St. Patrick’s Day feast, and left overs to share at work too! No adequate words to describe this, it was SUPERB! Will be making recipe from now on. I’m so glad you enjoyed it, Nate, thank you! For portions, approximately what size is a serving (in cups)? Took it to family get-together 5 adults 2 children and this was an extra large pot of stew. 1.5 times at least. I brought nothing home, all gone, even the 5 yr old loved it. Talk about hitting the nail on the head!! BAM. Making again tomorrow. Woohoo!! I’m so glad it was such a hit, Tim, thank you for the feedback! My husband is a recovering alcoholic what can I sub. For the Guinness? Hi Kimberly, I just returned from Ireland days ago and ate this stew in Dingle and Dublin. (Served with mashed in Dingle, potatoes in the stew in Dublin) Loved it and eager to try your recipe at home. I have a question relating to Kathleen M’s concern about this stew and her recovering husband. Isn’t the alcohol boiled out of the Guinness by the time the stew is done? My husband is recovering as well. I don’t want to keep him from savoring this! Hi Janis, there will likely be some alcohol still present after cooking, how much depends on the heat level (I like to vigorously boil the alcohol for a couple of minutes in step 2) and how long it’s cooked. If you type in online “how much alcohol is left after cooking” you’ll find several sources that provide info on that very question. Hi Kimberly. I have A very large slow cooker and would like to double this recipe. Would you make any adjustments other than actually doubling the ingredients? I saw previous comment about the Guinness having a bit of a bitter taste, and wondering if I should add two bottles or maybe a little bit less. Thank you. I’m looking forward to making this. Hi Carole, that’s right, simply double all the ingredients, no other adjustments necessary. For the Guinness, you can always start with less, then taste the stew and add more towards the end if you like. Happy cooking! Fantastic, Damien, thanks for your vote of approval and feedback! Though I probably shouldn’t admit it, I tend to prefer stews served over mashed potatoes, but shhhh, don’t tell anyone ;) The British Isles: I certainly don’t mean that as a political designation but rather a geographic one. Britannica: “British Isles, group of islands off the northwestern coast of Europe. The group consists of two main islands, Great Britain and Ireland…” Whatever political tension may exist around the use of the term, I’ll stay out of those particulars and at any rate I mean no offense! Wonderful, Sandra, I appreciate the feedback and am so glad you both loved it, thank you! OMG.. fantastic… although.. didn’t add carrots or parsnips (not a fan). I didn’t have celery so added celery seed and didn’t have tomato paste, so put in some Organic ketchup. I always have a jar of bacon lard in the fridge and actually kept adding quite a bit because the fat rendered from the bacon was not enough. I kept adding lard while browning the meat so it wouldn’t burn badly on the bottom. 2 bottle’s of 11oz Guiness… the finished product… just WOW. I was worried the potatoes would overcook.. they didn’t… but, I still think I’ll take them out and mash them… melt some butter on top… slop on the stew… and yummmm. Making soda bread to go with.. Thanks! It’s a keeper… Go raibh maith agat! Fantastic, Sheila, thanks for the feedback! In my opinion you can pretty much NEVER go wrong with copious amounts of bacon fat :) Sláinte chugat! Never… lol. The recipe looked so good I just used what I had on hand… perfect! Phenomenal Guinness stew, the BEST I’ve ever had and I’ve tried many, thank you! I’m so thrilled to hear that, Teresa, thank you! I’m going to be using my crock pot for this. One step is not clear to me though. After I put everything in the crock pot, do I then put the Guinness in the pan I just fried everything in and let it boil for 2 minutes and then pour into the crock pot? Hi Carmen, sorry for the confusion, the crock pot portion should have been the next step down, I’ve just moved it. First add the Guinness, bring it a boil for a couple of minutes and then pour the stew into the crock pot. Happy cooking! I made this recipe exactly as written. It was PERFECT! So delicious!!! Awesome, Alex, I’m so happy to hear that, thank you! Can you double this recipe? I am serving 5 and I am sure people wold like seconds, and would love to have left over stew. Can you freeze this? Hi Henrietta, yes to both! Happy cooking and Happy New Year! Hi Kimberly, I’m excited to make this. I’ve looked through many recipes but yours intrigues me the most. The only problem is I am excited to serve this with/over colcannon. So I don’t want to cook the potatoes in the recipe. Is there any change to the amount of liquids (can’t touch the Guinness LOL) or any other suggestion you’d make if omitting the potatoes. This meal is fantastic. I read some comments about it being bitter. So , I made a couple of adjustments. I reduced the beer by 1/2 cup and increased the beef broth by 1/2 cup. I then added 1/4 cup of sugar. I was pressed for time so I did the assembly on the stove top a put it in my Power XL pressure cooker for 20 min. Then I added the potatoes and cooked them another 20 min. On high. Everything came out perfect, the flavor robust the meat was tender . I truly believe this was one of the best stews I have ever made. Everyone loved it . Thank you for your recipe. Fantastic, Dawn, thanks so much for the feedback! This was absolutely delicious! I’ve made it twice now and everyone loves it! Wonderful, Karen, thank you so much! Made this for dinner tonight. I am not a stew person,but this was awesome !! end of cooking too thicken. Fabulous, Sandra, I’m so glad it was a hit, thank you! We have made this recipe for the last couple of years. It is delicious! Now when I make something new everyone always asks “is this A Kimberly recipe?”and I always answer yes it is. Thanks so much for all your great recipes! Bless your family’s hearts, Peggy, that’s the best compliment I can imagine! :) As always, I really appreciate your feedback, thank you! I have this in the slow cooker now. It is the week prior to St. Patrick’s Day. I have a contractor working on my house and he has gone over and above expectations. I am sending this Stew home for he and his wife as a Thank You. What a kind gesture, Carol, I’m sure they’ll be thrilled! I doubled this recipe and it was a lot of work, but so worth it. Absolutely delicious! I will be making this on a regular basis. I’m so happy you enjoyed it, Donna, thank you! Hi Kimberly, I made this tonight (with popovers) for my family for St. Patrick’s Eve. I’m so happy to hear that, Laura, thank you for the feedback! Fantastic, Caroline, thanks so much! Thanks so much for the feedback, Mary, I’m thrilled everyone enjoyed it! Without a doubt this is the BEST stew ever!! I have been trying many versions, most just a tepid success. My guests just melted upon consuming the tender meat after the welcoming aroma entering my home had them salivating. The key point in this dish is to NOT rush. I prepared the recipe as indicated, finishing it in an elegant Dutch oven simmering @ 200f for 5 hours, that made the meat so tender. I doubled the quantity for 12 people adding about 20% more meat, the more meat meant a wicked amount of fond. Looking forward to trying more recipes from your website! I’m absolutely thrilled to hear that, GourmetAnderson, thanks so much for the feedback and I hope you equally enjoy the other recipes you try! Just made this and it is delicious. Thanks so much for this recipe. I was very busy working all day on St. Pat’s Day and held off making this until today. It was worth the wait. My family loved it! I’m so glad you enjoyed it, Beth, thank you!